Tens of thousands of Eneco customers with a digital energy and/or gas meter receive an email with information about their used/delivered energy and used gas each two months. With PlaatEnergy I could proof to Eneco that this report contains a mismatch between the reported time period and the measured energy and gas values. General: Added security shield arround WebGUI based on sessionId. General: Improve customer query report. General: Redesign solar deliverable charts (Now they are more flexible). General: Added option to select solar meter vendor. General: Improve theme and language hyperlink. General: Added home password feature. General: Added setting password feature. General: If database connection fails, user is informed. Imported all solar csv data in database. Add P1 energy meter python sensor script. Add AstroHat weather sensor script. Add energy, solar, gas year reports. Add energy, solar, gas month reports. Add energy, solar, gas day reports. Add temperature, huminity, pressure day reports. 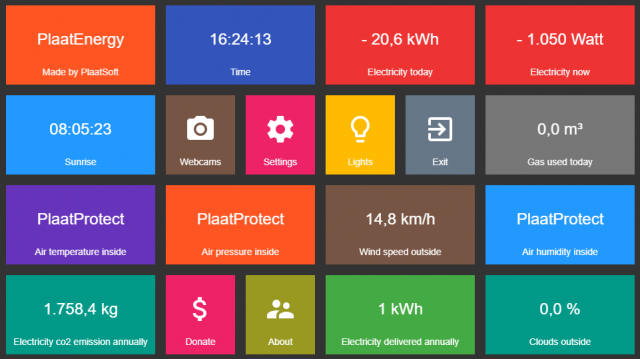 Add realtime information GUI (Created by bplaat). Add solar meter python sensor script. Store solar in CSV file.